Since we’re moving this blog to another site, please click here to see information, videos and links to great, proven organizations that really could use a donation of time or money this holiday season or any time for that matter. We also encourage you to look at some a couple of posts from past Veterans Day and remember how many US soldiers, marines and sailors are still very much in harms way. 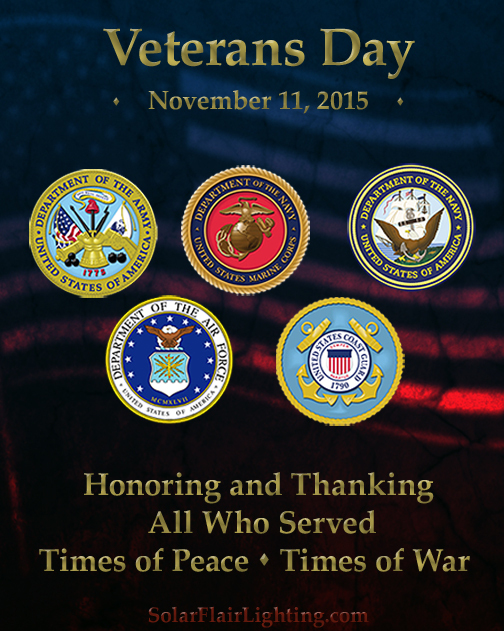 We thank all Veterans, active service members and their families today and every day. May they all come home safely SOON! If they don’t, and even when they do, there are far too many who will need your support. Your time and donations are needed to make sure their sacrifices are truly honored by all Americans. This entry was posted in Seasonal and tagged Great Veterans organizations, honor and support Vets and active service men, organizations for military families, Veterans Day by SolarLightingSmart. Bookmark the permalink.